#39. 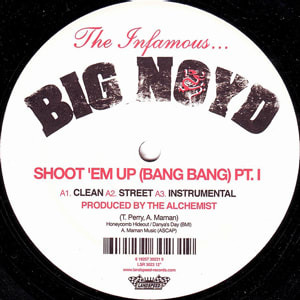 Big Noyd "Shoot Em Up (Bang Bang) Pt. 1"
As the Queensbridge equivalent to M.O.P. 's Teflon, Rapper Noyd has served as a loyal soldier to the Mobb Deep crew formerly known as the Poetical Prophets. When provided with a knocking beat and appropriately catchy hook, as The Alchemist has done here, Noyd's ever-reliable recipe of gun talk and deadpan threats of inflicting bodily harm goes down like a shot of well-aged whiskey. "Part 2" works just as effectively in its own right, but it's the precise chop and vocal snippets that seal the deal on the original.